Today's giveaway is for a fun camera package! I love instant photos, don't you? I am glad they are not completely gone (after polaroid discontinued their film) and are still going strong. Here's what you can win in this set: Instax Mini 7S instant camera, Polaroid Pogo - Instant Mobile Printer, Pack of film for the instax, and a pretty sweet map bag to hold your instax & pogo! A total retail value of $275! You may have already entered a couple of the giveaways from the past couple days so you pretty much have an instant entry - just enter your information below for it to count in this particular giveaway. Some new ways to win: Tweet about this giveaway, follow us on instagram, and sign up for the goodcheerdeals.com newsletter! Fine print: You must provide the required information for each entry or your entry will be deleted. Be sure to check back here to see if you are the winner! Winner will be chosen randomly. The more points you earn & entries you receive, the more chances you have to win! Sorry friends, this giveaway is not open to international residents! See additional fine print details in the widget below. AWESOME giveaway!! I have always wanted one of these cameras! My favorite show is Grey's Anatomy. Cheesy but I still love it! My favorite TV show? Oh man... I love anything on the food network! I still just love Friends! I also have a weakness for Hart of Dixie..cause it is sweet and silly and a nice little relief. Freaks & Geeks is the best season of tv ever to air. OK my favorite TV show is Mad Men! It's so beautifully done, and this season has been a riot. New Girl is pretty high up there, though. My favorite TV show is currently New Girl- I just love Zooey! Oh I have been wanting this camera for sooooooooo long I HOPE I win <3 My favorite show is True Blood. Fave TV Shows Currently On: Anything by the BBC (Luther, Sherlock), Downton Abbey, Modern Family, Dexter, documentary related shows and the Amazing Race. My favorite tv show is Parks and Recreation. btw it will not allow me to sign up for good cheer for the points all though I subscribed. Modern Family and Revenge are my favs right now. Love the give away! My favorite TV show is How I Met Your Mother! I just love it. Thanks!! My favourite show at the moment is White Collar. Of all time... The A-Team, definately. Cheesy fight scenes and the good guys always win. I'm going to be a total nerd and confess that my favorite tv show is Doctor Who. I'm super in love with the Walking Dead. Is it weird that I kind of base my calendar year around October now, solely for this show? Possibly. I LOVE polaroid cameras and was so happy when they designed new products after discontinuing their film! 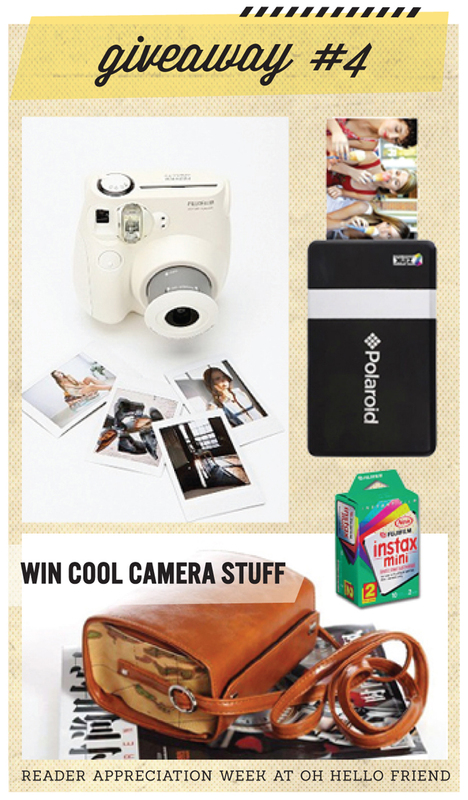 This Instax camera looks like the bomb and I would love to win it (crossing my fingers)! My favorite TV show is Modern Family! So great. Pretty sure no one even knows this show....but I will always love Road to Avonlea! Oh my goodness how I would love to win that camera! I still have an iZone and a long for the days of instant photographs again! Ha ha, right now, my favorite TV show is The Nanny which has made it's way to Netflix. Love it! Hard to choose! I think my husband and my favorite show was King of Queens...currently I'd say Psych! obsessed with Mad Men right now. I do love the New Girl, but i find at times it can be a little uncomfortable and awkward. Still love Zooey though! My favorite tv shows of the moment are New Girl and Parenthood. I have two that I am watching right now. For suspense, The Killing. For fun, New Girl. I would love to have that polaroid camera for my photoshoots. To give them something they can leave with. My favorite tv show right now is Fringe, Grimm and the Killing. i don't know if i can pick just one favorite! these days my short list is fringe, new girl, community, 30 rock and parks & rec. My favorite TV show is true blood and I cannot wait for the new season this summer. Thanks for the giveaways. My favorite show is Dexter. i love that camera bag! Hi Danny! Congrats for your blog! I really enjoy reading it and watching your photos (which are always very inspiring I have to say!). I love this idea of making a reader appreciation week :). My favourite TV show in English is Downton Abbey. Love from Spain!! my favorite show has to be glee!! My favorite tv shows are Mad Men and Game of Thrones- I can't wait for Sunday each week! Our favorite TV show is Parks and Recreation -- got hooked on reruns through Netflix/Hulu, and now we can't get enough! So hysterical! My favorite show right now is The Killing. I'm hooked. BONES! We're obsessed with this show! I would have to say my favorite tv show is Andy Griffith! ha! I love the classics! My Favorite right now is "How I met your Mother." Just started watching it from the beginning on Netflix. Too funny. My favorite show is, hands down, Monk! I love love love him + I even read the Monk books! I've never used an instant camera, I'd love to try it. My favourite tv show is the UK The Office. My favorite is JAG re-runs. i love Big Bang Theory ! how to resist their geeky cuteness !?! i've always wanted one!! ahhhhh!! I love so many but I guess my fav was Rescue Me. I'm sad that it's off the air. New Girls is so fun and quirky! LOVE IT! This is such a hard question! Goodness! Right now I adore New Girl and Mad Men though. i can't help it. i love gossip girl. it's so lame, but i'm addicted! I just started watching Lost (on Netflix), and I'm obsessed. It's definitely my #1 at the moment. I'm not much of a TV watcher (I don't have one) but an occasional veg-out session with Netflix or Hulu never hurts. I easily fall for SNL anytime and I'm a newbie with Downton Abbey. i love film photography, it's what i shoot the most but i must admit that instant cameras are not in my collection, i don;t have one single polaroid camera, maybe this will get me started, if.. crossing my fingers. Parks and Rec is my fave! Also having trouble updating my subscription for the good cheer deals. All time favorite - Friends, current favorite -Dexter! gahh!!!! what a cool giveaway!!! This is an amazing giveaway! I've wanted one of these for ages! My favourite TV show of all time is Gilmore Girls :) And a more current one would have to be Modern Family. The Walking Dead is definitely my favorite though Modern Family comes in as a close second. Currently I'm really enjoying Burn Notice! forgot to put my favorite tv show... i think right now it's homeland, can't wait for the new season. Oh and also, my favorite TV show would have to be 30 Rock. i've been on a mad men kick lately, but, then again, who hasn't? great giveaway. REALLY crossing my fingers on this one. thanks! I am in love with Modern Family & The New Girl! I love Once Upon a Time and The Walking Dead! I love watching Bones, Lost, and Once Upon A Time! Great giveaway! Mad Men and 30 Rock! I LOVE watching The Office! So stinking perfect. I'm completely smitten with Once Upon a Time. Oh my! What a beautiful present! Please enter my name. Grey's Anatomy is the one show I do not miss. I've been watching it since episode 1! My favorite TV show ever is Beverly Hills! Hey! Just found your blog today and I love it! My Favorite TV Show is Parenthood! :) Thanks for the giveaway!! Subscrived by e-mail, I won't miss a post! These days, it's got to be Downton Abbey. Love it! Scroll to my "favorite places to be" for your lovely button. There is a button on my sidebar for anyone who wants to share, too! I have been wanting an Instax Mini for ages! Thanks! Favorite TV show: 24. I know I'm late to the game, but I've caught Jack Bauer fever somethin' BAD! i am currently in love with new girl! sometimes i laugh til i cry! My favorite TV show right now is definitely Community. It's like a TV show inside other little TV shows! How cool is this! my favorite tv show is Echte meisjes op zoek naar zichzelf a dutch show real girls looking for there selfs. My favorite show is has and always will be Gilmore Girls! Fingers crossed!!! Right now, I'd have to say Community--so so so funny! Did almost everything and now I noticed that it's not open for international entries. Too bad. Aw, well, it doesn't matter. Oh my goodness. I really want this one!! I'm really loving new girl and modern family right now! It's probably Parenthood - I just love all the story lines! These days I am watching The Killing, it's pretty good! My fave show is "Bones"! So cool! I love New Girl and The Big Bang Theory right now. My favorite tv show is NCIS! my favorite tv show is once upon a time! My favorite show of all times would have to be One Tree Hill!! Grey's Anatomy! Thanks so much for the chance! parks and rec is my current fav. also loving the voice. Favorite tv show would have to be New Girl!!! I love Zooey Deschanel! Right now it's Prison Break which is no longer on air. We actually don't have cable so we just watch the TV series that are on Netflix. We can get through an entire series in just a few weeks. It's kinda fantastic! My favorite show is Futurama! favorite tv show is how i met your mother, brilliant. Of All time: West Wing. Current: Once Upon A Time. My favorite TV show would be "Happy Endings"! and "Modern Family"
I want an instax so bad! Great giveaways this week! I've been wanting some of this stuff forever. So exciting! This would be a great birthday present for my sister!! I love NCIS and Fairly Legal. My favorite TV show at the moment is Ugly Betty. It's on Netflix and I'm obsessed! Such a great giveaway! I love instant cameras and have been wanting a fuji instax for a long time! My favorite tv show right now is New Girl. Guilianna & Bill is my fav show! love love love these giveaways! love your blog & look forward to more! thanks! oops forgot to tell you my fave tv show...it's a tie between i love lucy & friends! thanks! I am loving New Girl. Favorite TV Show: I have to pick only one?! Probably anything that I don't have to think too hard about. Like Community, Parks and Rec, and 30 Rock. So good. My favorite tv show of all time definitely has to be Fringe. Its just so good! love love love this giveaway! so cute Danni! I love Parenthood, can't wait til it comes back on! my have show right now is parks and recreation. sooo funny! My favorite TV show is Downton Abbey! Thanks for the awesome giveaway. I've been tempted to get a little instant camera for my wedding guestbook - this would be perfect! NOOOOOOOOOOOOOOOOOOOOOOOOOOOO!!!! WhY this one isn´t for international friends! why? why? why? Maybe , no for sure, my favorite giveaway always! My Favorite Tv show is.. Bones.. Or Castle... Or Eureka ! my favorite tv show is modern family! ooooh i love those little cameras! i don't have a smart phone but a little vintage-impersonating polaroid would be so fun! Favorite TV show: Parks and Recreation! favorite tv show is the mentalist!